Co-Optimus - News - Quick! Get Golden Axe for Free on Steam! Quick! Get Golden Axe for Free on Steam! And Jet Set Radio! And punch stuff! A co-op classic is sitting on Steam, just waiting for you to hit the download button! As part of the Make War Not Love promotion, Sega offers up free games for a limited amount of time at specified intervals. Right now, you can pick up several tasty Sega classics for free, including the dinosaur riding co-op beat-em-up Golden Axe. To grab the Make War Not Love prize bundle, head over to the Steam page, then click on the game you want to snag. At the time of writing, Jet Set Radio is also available, along with several iterations of Hell Yeah!. At the game's store page, scroll down a touch and click the happy "Install Game" button. Go through the necessary Steam prompts, then the game is yours! 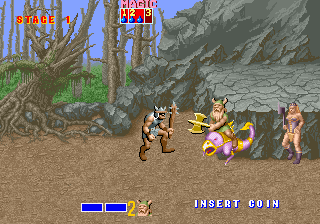 For the uninitiated, Golden Axe is hailed as one of the greats in the arcade beat-em-up genre. Three warriors, two local co-op players, and all the baddies you can wave a gigantic axe at. And remember: you can ride dinosaurs in Golden Axe. We can't stress that enough. Who Needs Co-Op in Golden Axe: Beast Rider? We Do! Page created in 0.7459 seconds.